The rubber mat and concealed metal jaws are bolted in place. When the pressure plate is engaged, two sets of jaws at ankle and shin height deploy, locking the person in place. Requires two people to release the jaws and reset the trap. A combat systems officer, Tina Lin Tsang is a focused and meticulous planner. She uses the Sterling Mk2 LHT or “Welcome Mat”, a floor mounted, rubber and metallic spring loaded leg-hold trap that provides her with a non-lethal means of immobilising her prey. 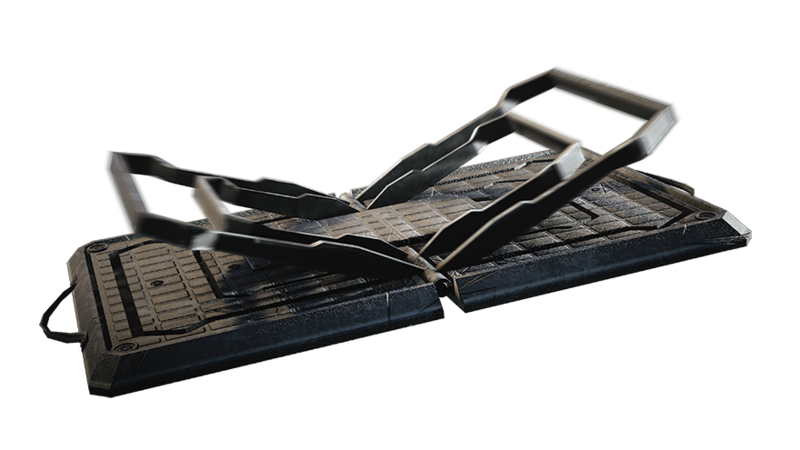 The sleek design of the “Welcome Mat” allows for seamless deployment in a variety of areas and environments without the need for extensive camouflage.